"Wonderfully crunchy on the outside and creamy on the inside. Great with garlicky aioli." Preheat air fryer to 400 degrees F (200 degrees C). Mix flour, pepper, and salt together in a shallow bowl. Beat together egg and water in a second shallow bowl. Place panko in a third shallow bowl. Dredge an avocado slice through the flour, shaking off excess. Dip into egg and allow excess to drop off. Finally press slice into panko so both sides are covered. Set on a plate and repeat with the remaining slices. 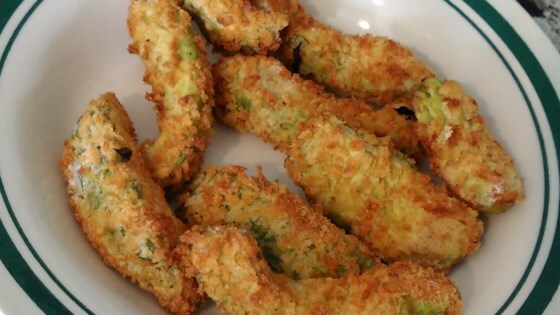 Spray avocado slices generously with cooking spray and arrange in the bowl of the air fryer, sprayed-side down. Spray the top side of the avocado slices as well. Cook in the preheated air fryer for 4 minutes. Turn avocado slices over and cook until golden, about 3 more minutes. Excellent. I made them gluten free, substituting with almond flour and gf panko. Nice and cruncy on the outside and creamy on the inside. Crispy and Creamy........ Nice! This is perfect with any meal, next version I will smash the avocados and make saucers then fry for whatever burgers come to mind! It was tasty but I think I would add the salt as needed directly to the avocado, it felt like it needed more seasoning. Other than that it was nice and creamy on the inside.